Based in Maryland, Kathleen Pellechia has been writing health-related articles since 2010. Her articles have appeared in the "Women's Health Report" newsletter. A registered dietitian since 2003, Pellechia was named "Recognized Young Dietitian of the Year" by the Maryland Dietetic Association in 2005. She holds a Bachelor of Science in nutrition from Rutgers University. Sitting at a restaurant staring down a large plate of pasta can be both an enjoyable and overwhelming prospect. According to the Portion Distortion Quiz from the National Heart, Lung and Blood Institute, a plate of spaghetti and meatballs averaged 500 calories in 1983. In 2003, a plate of spaghetti and meatballs contained 1,025 calories on average. Portion sizes have doubled over time and are continuing to grow. Knowing serving sizes of common foods can help you limit extra unwanted calories. Being aware of recommended serving sizes can be helpful when dining out or preparing food at home. While there are many online tools and mobile apps that can assist in identifying serving sizes of foods, all you really need is the palm of your hand to get started. The recommended daily intake of meat or other protein equivalents ranges from 5 to 6.5 ounces a day based on gender, age and calorie needs. Three ounces of meat is approximately the size of the palm of your hand or a deck of cards. Three ounces of fish is the size of a checkbook. One ounce equivalents in the meat food group include one egg, 1/4 cup of beans, 1 tablespoon of peanut butter or 1/2 ounce of nuts. Aim for 3 cups of dairy products a day, focusing on low-fat or fat-free versions. Serving sizes include 1 cup milk, 1 cup yogurt, 1½ ounces of natural cheese and 2 ounces processed cheese. Grab some dice to get an idea of the serving size for cheese: 1 ounce of cheese is the size of four dice. Eating a diet rich in fruits, vegetables and whole grains is important to maintaining good health. The USDA MyPlate.gov recommends aiming for roughly 2 cups of fruit and 2 to 3 cups of vegetables daily. A tennis ball is a good visual for one medium piece of fruit. 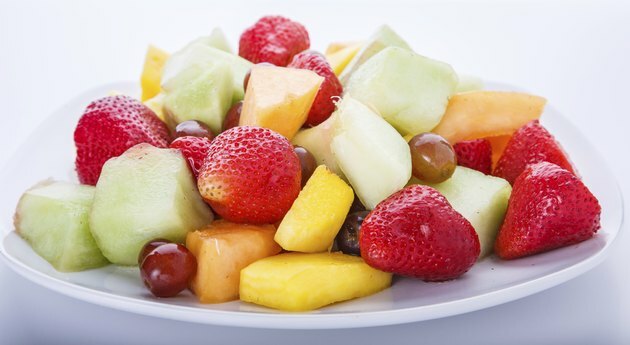 Other serving sizes for fruit include 1/2 cup of canned fruit and 1/4 cup dried fruit. A serving of cooked vegetables is 1/2 cup or about half the size of a baseball, while a serving of raw leafy vegetables is 1 cup. While it can be a challenge to fill your plate with fruits and vegetables, carbohydrate intake in the form of grain foods is often not an issue. A serving of pasta is 1/2 cup or the size of a tennis ball, but often the portion we have on our plate is much more than the recommended serving. Eating half of the dish when eating out and taking the rest home or using measuring cups to serve food at home can help when managing calories from grain foods like pasta and rice. When choosing grain foods, focus on whole-grain sources to boost fiber intake. Regardless of how much food is on your plate or your portion size, keep in mind that serving sizes are the key to regulating calorie intake. One portion can contain multiple serving sizes. Share food with friends when out at a restaurant and be mindful of how food is served at home. Using smaller plates can help keep serving sizes in check and bring you one step closer to better health. Colorado Extension: Portion Size vs. Serving Size: What’s the Difference? MyPlate.gov: http://www.choosemyplate.gov/food - groups/ protein - foods - amount .html How Much Food from the Protein Foods Group is Needed Daily? MyPlate.gov: How Much Food from the Dairy Group Is Needed Daily? MyPlate.gov: What Counts as a Cup in the Dairy Group? MyPlate.gov: How Many Vegetables are Needed Daily? MyPlate.gov: What Counts as a Fruit Serving? MyPlate.gov: What Counts as a Vegetable Serving?